Ten Squads, Ten Stories is a series that concentrates on one team in the National Women’s Soccer League (NWSL), and highlights a player or theme. 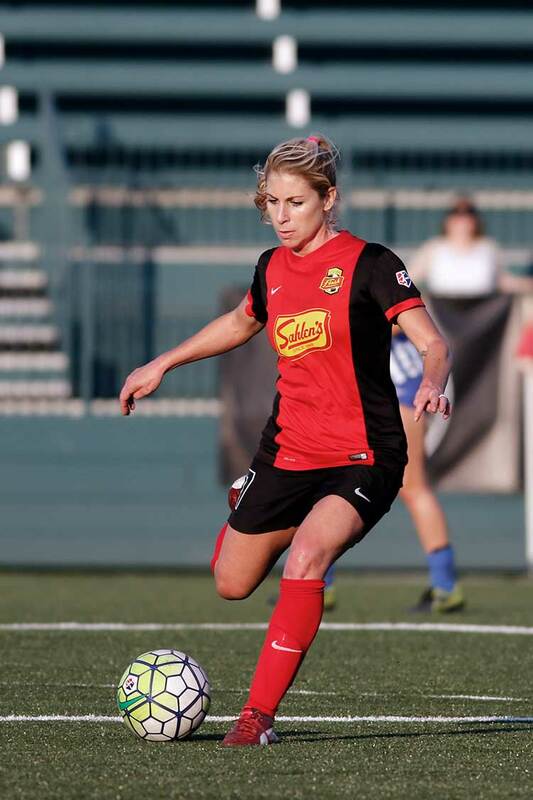 This installment features McCall Zerboni and her recent return to the Western New York Flash, where she spent four years of her professional career. The young, upstart Western New York Flash were hosting the Portland Thorns FC in an important match as the National Women’s Soccer League was closing in on the halfway point of the season. Moments before the second half, a familiar face stood by the fourth official; McCall Zerboni, who spent four years with the organization between 2011 and 2014, made her long-awaited return to the Rochester area as a member of the Flash. Zerboni, a former UCLA Bruin and now a veteran professional, was part of the glory years for the Flash, helping the team to the 2011 Women’s Professional Soccer title and 2012 WPSL-Elite crown, along with captaining the side to a NWSL Supporter’s Shield in 2013. Even with spending a season and a half away from the area, she felt right back at home in a comfortable position. Just three days prior to her return, Zerboni was acquired in a trade from the Boston Breakers for a second-round draft pick in the 2017 NWSL College Draft. Head coach Paul Riley wanted to add an experienced player into his midfield that could help the team continue to develop while making a run for the postseason. Two matches into her return with the Flash, Riley has been pleased with how quickly Zerboni has settled into her role. We often see mid-season trades in American sports, most notably by teams on the cusp of making the playoffs. These types of trades, no matter the sport, present challenges for both the incoming player as well as the rest of the squad. In this case, Zerboni spent the preseason and half of the season with the last-place Breakers. The results on the field were not going her or the team’s way, plus her fiancé and several close friends are based in the Western New York area, so it was clear to her that she needed to be back in New York. Now she comes to a young Western New York team making waves in the NWSL. Unlike the Breakers, the Flash have been able to pull through and muscle out some results early in the season and are now clicking on all cylinders. When Zerboni walked into the locker room for the first time, the team welcomed her in quickly, helping her to gel with the team in a short time. Riley acknowledges that one of the reasons why Zerboni’s transition has been so smooth is that his young players want to be around veterans like her and learn from her experience so that they can be better professionals themselves. That is a role that Zerboni is now relishing as being one of the team’s elder stateswoman and has bought into that team-first mentality the Flash have created. “We want to put out the best XI on the field and if that’s not me for one week, it’s not, and I’m happy to have someone else in front of me so we can be successful as a team. I gladly take on that role and having that accountability and responsibility that I can have and I just want to know that I am helping the team and the players get better,” she said. When an athlete has the opportunity to play for a lengthy period in one city, they can become a fixture in the area off the field as well. With this now being the fifth season Zerboni has played for the Flash, fans have become accustomed to the number 7 jersey and her work ethic on and off the field. Of all the moments that have stood out to Zerboni when looking back on her days with the Flash, the one that comes to the forefront dates back to 2011 when the Flash won the WPS Championship in penalty kicks over the Philadelphia Independence in front of more than 11,000 fans at home. Moments like that resonate with a fan base and she made a name for herself that year as she continued playing for the club in the years after. Riley believes that having that fan connection and coming back to a place she knows so well and loves can only help a player’s transition go smoother. While years 2011, 2012, and 2013 were good ones for the Flash organization (along with 2010 as they won the USL W-League before moving to WPS in 2011), the past two years in NWSL haven’t been so good. The team finished in the bottom half of the table in the past two seasons and saw a mass exodus of players and coaching staff as well. Now with Riley at the helm and a young nucleus mixed with key veterans, the Flash are in a position to return to the playoffs, something they haven’t done since 2013. Which is why having Zerboni on board was a key move for Riley; bringing in a player who has won before and can help players around her improve will ultimately help push the team to reach their goals. Zerboni knows that this team is much different from the championship-winning squads she played with before. However, she believes this is also a team that can thrive this season and make a run at the title.